A new kind of fluorescent organic nanoparticles (FONs) is obtained using quatsomes (QSs), a family of nanovesicles proposed as scaffolds for the nanostructuration of commercial lipophilic carbocyanines (1,1′‐dioctadecyl‐3,3,3′,3′‐tetramethyl‐indocarbocyanine perchlorate (DiI), 1,1′‐dioctadecyl‐3,3,3′,3′‐tetramethyl‐indodicarbocyanine perchlorate (DiD), and 1,1′‐dioctadecyl‐3,3,3′,3′‐tetramethyl‐indotricarbocyanine iodide (DiR)) in aqueous media. The obtained FONs, prepared by a CO2‐based technology, show excellent colloidal‐ and photostability, outperforming other nanoformulations of the dyes, and improve the optical properties of the fluorophores in water. Molecular dynamics simulations provide an atomistic picture of the disposition of the dyes within the membrane. The potential of QSs for biological imaging is demonstrated by performing superresolution microscopy of the DiI‐loaded vesicles in vitro and in cells. 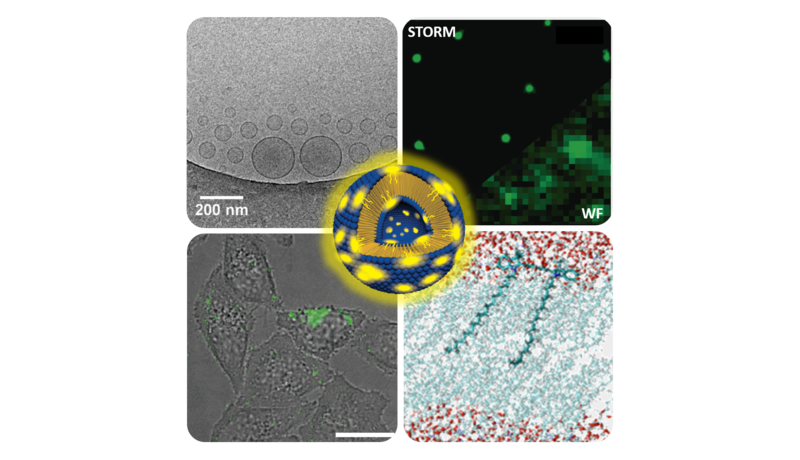 Therefore, fluorescent QSs constitute an appealing nanomaterial for bioimaging applications.